Guide to Hosting a Trivia Night - TriviaMatic! Trivia nights have basically flourished in bars across America. Today it has proven to be an effective technique for bars, pubs and other venues to generate great weekday nights. However, keeping a trivia night going is another matter. Our easy-to-follow guide will show how to establish and maintain great trivia quiz nights at your bar. Applying to advanced technology makes a difference. It’s important if your venue has a good tech system. If you decide to have questions and answers displayed on the screen during the trivia event you need to have at least one wireless HD television. Connect your laptop, PC , another device to the TV . Having the quiz on board is a great way to see questions, update the scores, and all teams will see where they stand . Projector is another help gear to equip your bar for a tricky trivia night. You only need HTML access that will connect your laptop to the TV. Basics to set up a trivia night is to include PA speaker system and microphone as well. Wireless microphone system allows more flexibility in an event. Have a good sound system to play music before the nights starts and during breaks to entertain and get more advanced. The high quality speaker system and easy to-set-up design is a fun addition to trivia nights. A few weeks before your first trivia quiz night, let people know about trivia event in the early stages. Because you always have good customers doesn’t mean you stop promoting. That’s why your goal is to convince your customers to try out the trivia bar quiz. You blog about the events of last quiz, give hints for next week’s trivia event, announce innovative prizes, etc. to keep people interested. Your task is to make them experience a great trivia night and make them happy. Decide what Trivia event you want as this will retain people’s attention. Social media is a strong platform that gets people into your bar and try out the trivia bar quiz. Spent time posting trivia night information in all preferred social media networks like Facebook, Instagram, Twitter, etc. as well as mailing and use of a website and provide a venue to all your potential customers. You can create an event on Facebook easily, invite people you think will be interested to join, or make a page for the quiz night. It would also be helpful if the venue can publicize the event through its own Facebook page, Twitter account or something else. Make sure you give constant information about trivia night to get word out there. This is a cost effective way to get your potential customers keep your trivia night in mind for a long time. Putting well-designed signs and various eye-catching banners in your bar is a good way of spreading the word about your trivia event. Post different signs at different places near your trivia night location to gain people’s attention and raise interest among people. Word-of-mouth reputation is one of the keys to success and posting signs and banners guarantee your upcoming fame. Hosting a trivia night and considering the simplest details really matters. 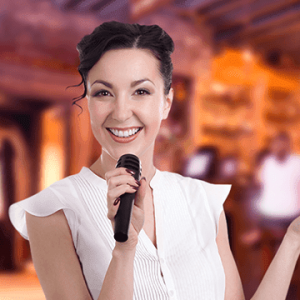 Charismatic host has always been a number one aspect of a fun trivia night and a good promotion for your business. TODAY we offer an unbelievable solution for a new generation of trivia nights.Trivia Matic app with great user experience design will be YOUR FRIEND from now on.You can organize the whole event but let our all-inclusive functional Trivia Matic app do the job. Appeal to a wide range of categories, from celebrities to science, from history to music. Decide on different categories you want to include. You may want to include a 6-round game for History, Nature, Animals and General Knowledge. If you decide to have a theme for the trivia you can still choose to have different rounds, with every question related to the central theme. You can use the themes of upcoming events to build a marketing strategy for success. We recommend that you keep your entry fees and prizes acceptable, though it’s completely optional and depends on the purpose of the event. Small prizes will discourage people from playing and large prizes will encourage professional trivia players to turn up and steal the chances of your regular customers. So offer some great PRIZES : discount, a bottle of wine, free meals to winners, purchase gift cards, gift certificate, etc. Whatever they will be they need to be fun and creative. Keep your trivia nights constant as people get disappointed if the night doesn’t meet their expectations, keep things flexible for teams of any size. Your existing customer base will be the foundation on which a great trivia night will be built. Always remember that regular quiz night at your bar is a great way of generating your business. There are different ways you can run your trivia night . Nowadays innovative technologies give an opportunity to organize trivia nights using apps just with one tap. We changed the way people approach trivia nights with something new. No papers, no cheating. In other words, first step to a successful public event is through the well-designed apps that help venues to access trivia quiz information, social media and contact immediately. We offer Trivia Matic creative application for smartphones available in app stores where fast-paced style takes trivia nights to new heights. Choose your quiz theme from a wide range of categories and boost your business with us ! Follow the first steps that lead you to the Trivia Matic world with just few taps. STEP 1. Trivia Matic is now available on Google Play Store and Apple App Store. It’s super easy to download the app and register. STEP 2. Create your business account as we offer you a professional strategy to promote your business. STEP 3. Choose your favorite trivia quiz theme from a wide range of options : from music to history, from sports to lifestyle. STEP 4. Have your trivia event ready on social media, in other words let people know about your trivia event at least a week before to attract those people interested in a certain trivia theme. BE PREPARED ! To guarantee a large and smooth event, plan your event, budget, quiz themes before the trivia night begins. This will allow to target certain demographics and properly market your trivia event to customers. Once the word gets out, you’ll be amazed at how people attend. Enjoy organizing the event, and make sure that people would be able to enjoy their nights too ! PreviousPrevious post:Using Sports Trivia to Attract FansNextNext post:Why Do People Love Trivia ?